Spend a couple of hours with these beautiful animals, trekking through the East Devon countryside from our farm outside Sidbury. Becoming an alpaca trekker will be an unusual, enjoyable, and unforgettable experience. You will be able to take in the glorious scenery of the Roncombe Valley with its steep tracks and rolling hills, or an easier, but just as enjoyable walk, can be arranged. The tracks and pathways may be uneven and suitable footwear and clothing should be worn. Treks can be from 1 to 2 hours in duration and you are welcome to bring a picnic. 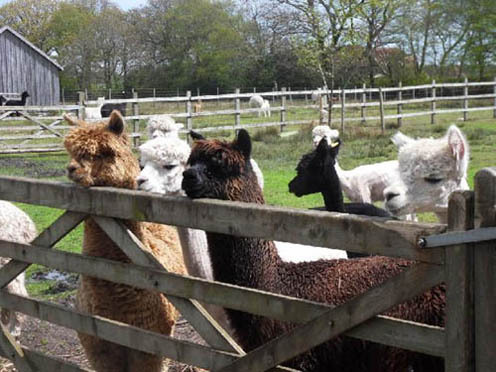 Our herd is currently running at around 60 alpacas from which we offer breeding stock as well as pets in a range of colours and to suit all budgets. Alpaca yarns, socks and other alpaca products are sold from the farm and on our on-line shop: www.bearhousealpacas.co.uk. 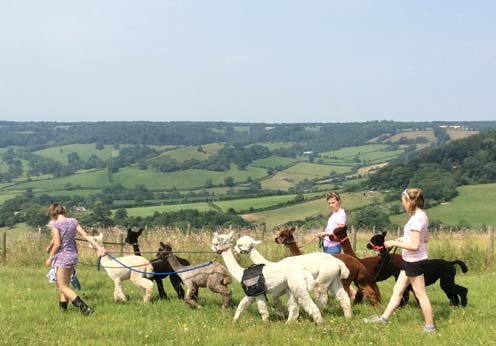 For friendly, professional advice or to arrange viewing of our animals or alpaca trekking, please contact Pippa Westall by phone 01395 597693 or email: info@bearhousealpacas.co.uk. Website: www.bearhousealpacas.co.uk.